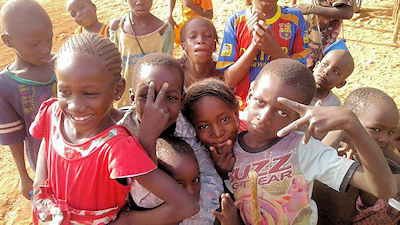 I invite you to join me in helping some Tuareg nomads in a desert village near Timbuktu, Mali, to start a school for their children. This isn't just about starting a school. This is about the revival of a desert village after a time of drought, war and economic downturn following the 2012 jihadi war in Mali and the consequent collapse of tourism in the area. 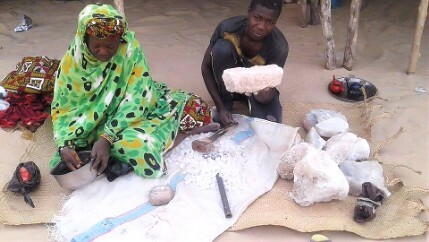 Apart from herding and trading, as Tuareg traditionally do, the villagers make crafts for sale in Timbuktu - except the tourists have gone and that option has gone with them. 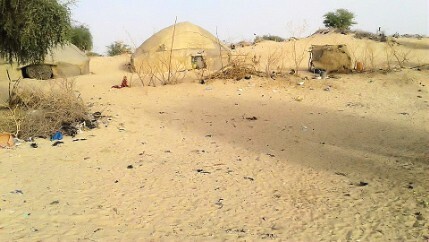 Drought hit the Sahel in recent times, decimating their herds of goats and camels. The war started out as an independence war by the Tuareg in the north of Mali, who felt misgoverned and neglected, and then the Tuareg were eclipsed in 2012 by Al Qaeda-supported Jihadis (a spill-over from war in Libya). The jihadis were then battled by French troops in 2013-4. The effect of this was to scatter many members of the village to refugee camps in other countries such as Mauretania and further afield. The village hit hard times. 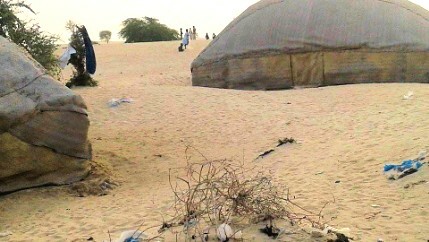 The village, called Tinzibitane Elabdach, is 45km west of Timbuktu in the Sahara. 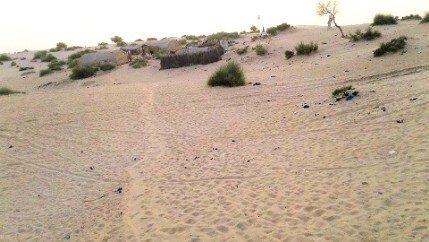 It is dispersed around an area of the desert so that different families can keep their herds separate. But it functions as one village under one chief - and here he is, in the picture. He has sent me greetings for all of you and thanks you for considering supporting their village. The Tuareg are traditional people living a simple life, but they're astute too, and they know they must square with modern life. That's why they want to start this school - they wish to raise their game in the longterm, and of course they care about their kids' futures too. 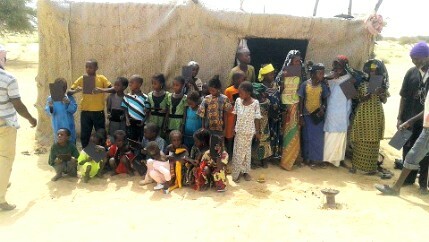 The government of Mali doesn't help them, because they are Tuaregs, so they must provide for themselves, with our help. Before the  crisis we built our school in tents, but people had to flee to refugee camps. Today we are back and we need to build a three-classroom school in cement. We want three teachers, and tables, chairs and blackboards so our kids have all they need to study. We are committed to make that possible and that's why we require your help. Before the crisis we had a lot of kids but fewer teachers and less room, so we taught some in the morning and others in the night [afternoons are too hot]. We really don't want to do that again - we want all of them to study together. We are expecting to have more than 50 students per class - students from 7 to 15 years old. We have the money we collected [from our own people] but we need more so that we can start to build the school and buy materials together and then pay the teachers. They are working on assembling materials and making preparations, and they are ready to start when they can, soon. I wish to make this possible for them, and I shall be monitoring developments and working to build more ongoing support so that they can keep the school going. I'm seeking to raise around 6,000 GBP for this. 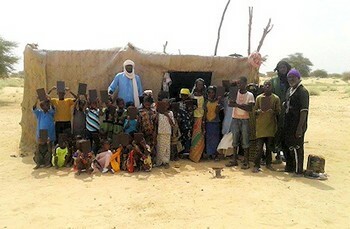 In case you think this is a lot of money, it's the cost of educating 1-2 children in a British school, but in Mali it educates 50ish children. I was contacted in 2014 by Anim al Housseini Touareg on Facebook, then 27. He was formerly a tourist guide and craft seller in Timbuktu, but business collapsed after the jihadi war in 2012-13. Speaking Taureg, Arabic, French and English, he is now a kind of fixer and ambassador for the village, working with and for the village chief. In 2016, Anim was hit by tragedy. 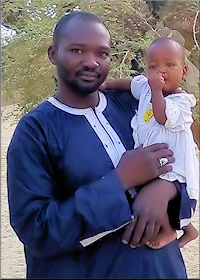 His wife died in childbirth and his newborn child Zeinabou was at risk too. I did an appeal on Facebook and raised the money to pay hospital fees to save Zeinabou's life. Early in 2017 Anim's camel died. A camel is an absolute necessity to a Tuareg. I managed to raise money with the help of generous friends and contributors on Facebook, and sent it to Anim for a new camel. It seems to be a genial and trusty camel too. This wasn't just a goodwill favour for Anim. As the village fixer, a camel for Anim meant a lot to the village as a whole. It enabled him to get around, to represent his village out there in the wider world. Later, Anim told me that the village chief needed my help. He wanted to start a village school. Hm, this was a big challenge, needing thought and discussion, and I had my doubts. Large-scale fundraising is not my baby - I'm a people-fixer, not a fundraiser - and I told Anim so. I was busy writing a report on the future of the world in 2050 - no small matter. I had to tell Anim this plan would be difficult. There was a silence. I was hoping I hadn't offended them. 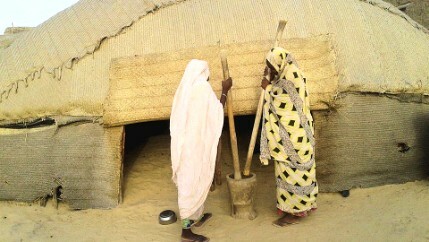 But the Tuareg are independent nomads and they do not like relying on others for help. Anim came back after a while with a story. They had put a signal around the distant refugees from their village and, before long, they had raised some of the money to start the school. 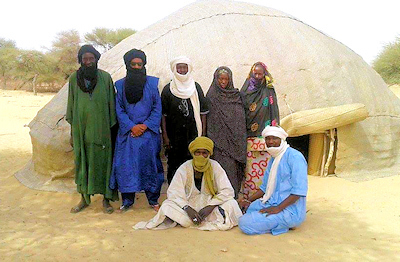 Not only this, but many of the Tuareg refugees decided to start coming back from abroad - after all, starting a school was a sign of hope for the revival of their village of Tinzibitane Elabdach. I told Anim I would try to raise the rest of the money. This felt important, since it concerned the whole village. That's why I'm doing this now for Tinzibitane, a desert Tuareg village that's now gradually getting better known globally on Facebook. The total amount I am seeking to raise is £6,000 GBP (€6,800 Euros or $7,870 USD) to cover all that is needed, accounting for bank and transfer charges, modest expenses and currency fluctuations. The full amount needed is about 5,250,000 CFA (£7,070 GBP). 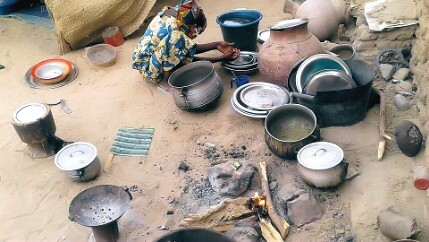 The people of the village have raised 1,000,000 CFA (£1,350 GBP) themselves. 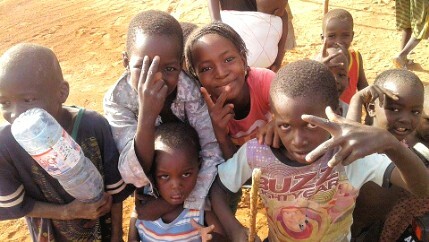 So 4,250,000 CFA (£5,750 GBP) is the amount they have asked me to raise for them. Raising £6,000 will cover all expenses (mainly bank charges) and give the villagers a wee bonus. First, they need to build three classrooms, and secondly they will need to buy tables and blackboards. Thirdly, they need to pay three teachers for a school year. Building three classrooms will cost about 3,000,000 CFA (£4,040 GBP), including paying the builder. Tables, chairs and blackboards will cost about 900,000 CFA (£1,220 GBP). Each teacher will be paid 50,000 CFA (£68 GBP) per month. The total cost for teachers for the year will be about 1,350,000 CFA (£1,820 GBP). They need guaranteed pay for the whole year so that they will make a commitment to stay with the village school - and to give them a bit of security and encouragement. Anim writes: "We haven't got any other support. We tried to get something from the government but they refused to help us. 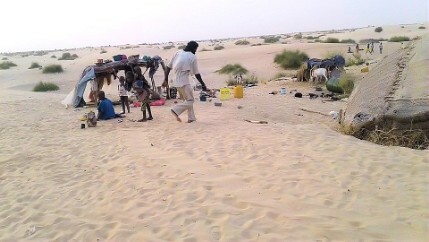 The Mali government doesn't help people from the north and the Tuareg particularly. This is very sad but we don't know what to do about that." Can these people be trusted? Yes. The Tuareg have high moral standards - they are self-sufficient desert nomads with centuries of experience in desert trading and camel transport, and their word is their bond. Their auditors are Allah and their tribal goddesses. They don't like asking for help, but they are in a dire situation and, to improve their prospects longterm, they need to invest in their children. So I feel happy and good supporting them. Personally, I trust Anim and the chief of Tinzibitane. I carefully choose causes on the basis of the people and their capacity to carry out their side of the deal, not just on the worthiness of the cause - this I have learned over the years and, working voluntarily, this is the only way I can work effectively. Anim is good at providing me with the information and photos I need to raise funds and moral support for them. I commend these people to you. They will do what they say and do it well. I hope you trust me to get things right. If you don't know me, then click here to get a bit of my humanitarian history. I do this voluntarily: my reward is the joy of seeing crisis-ridden people revive, restore their lives and move forward. These people pray for me too: that is a very great blessing. Thank you so much for reading this page. If you are moved to join in crowdfunding the school, you are very welcome - just click here. The chief and the villagers of Tinzibitane Elabdach extend their thanks and greetings to you. News of further developments will be posted on this page and on Palden's page on Facebook.